The Tornado trail is located near Little Park Road between the Lunch Loop System and the Third Flats Area. And there isn't really a trail named the Tornado Trail. The trail is really there but it isn't shown on any maps and there aren't any signs or trail markers other than where this post begins along the side of Little Park Road. 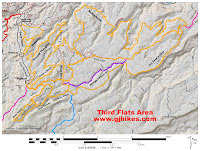 The trail is used by hikers and mountain bikers and it may be that the BLM has plans to further develop it, probably in cooperation with COPMOBA. The trail map resembles a tornado and I have had inquiries about it so until we find out what the name turns out to be I will post it as the Tornado trail. The pullout along the side of Little Park Road isn't much of a trailhead but the cutout in the fence line seems to beckon to the passerby to 'hike me, hike me'. It actually makes a lot more sense, or is perhaps more convenient, to park at the Little Park Road trailhead just down the hill. This is actually the only time that I have parked here. The trail climbs slightly as you begin but quickly reaches the high point of the hike where there are some nice views of the valley. There is a fork in the trail right after you get started. This post describes taking the route to the right and returning from the other way. The trail is very distinct and easy to follow but there are several places where connecting trails intercept the outer loop. If you would like to shorten the hike you can go left at either of these places and circle back to the start. Otherwise stay to the right to follow the outer loop. The trail eventually breaks over the northeast side of the hill and begins a gradual descent. Turn left onto the double track at the base of the hill and head west back toward Little Park Road. This route approaches the Little Park Road trailhead near the restroom. Depart the area heading south on the unmarked trail behind the Lunch Loop kiosk. 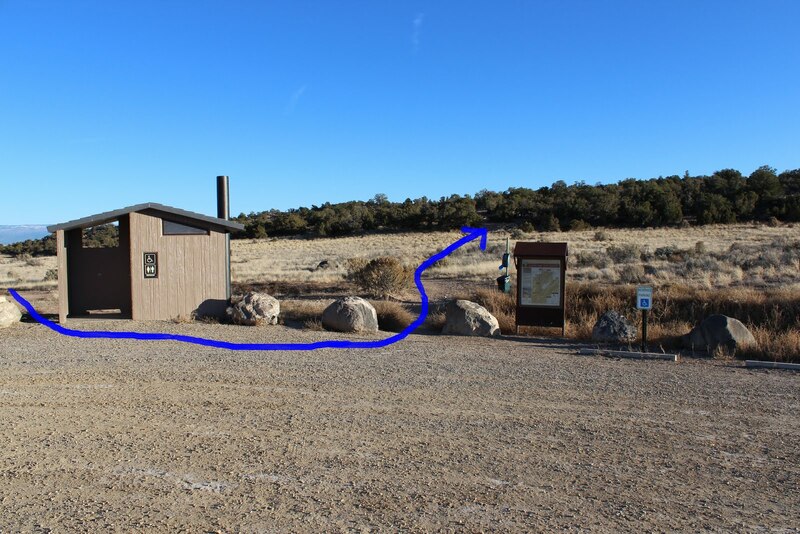 If you decide to park at this trailhead you could set out on the loop in either direction and follow the loop back the other way. The trail climbs back up the hillside to an open grassy field. If you continue to follow the trail to the right you will remain on the outer loop. There are enough hills to climb to get a good workout but the short distance and small change in elevation aren't enough to totally wipe you out. The area gets a lot of use from people walking their dogs and most seem to do a good job of cleaning up after them. 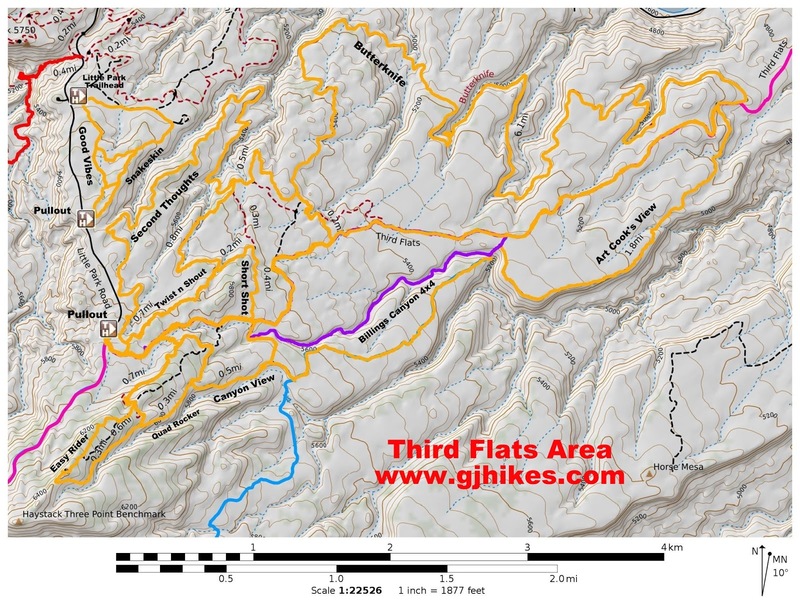 There are some mountain bikers that ride these trails in conjunction with the Third Flats Area trails and the Lunch Loop System. That makes for one heck of an outing. Whether you are out for a little trail running or want to checkout a new place to walk the dog the Tornado trail is yet another option. If you would like to see it for yourself then all you have to do is 'Take a hike'.